LOCATION: 6157 353rd St NE, Sterling, ND 58501. 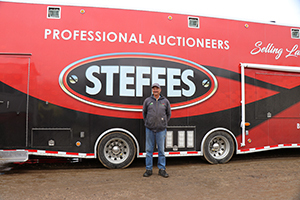 From Sterling, ND 1-1/2 miles east on ND 10 to 353rd St., 1-1/2 mile north on 353rd St.
AUCTIONEERS NOTE: Major equipment begins selling at 10:00 AM. Live online bidding available on major equipment. Registration, terms & details at SteffesGroup.com. Johnson single axle header trailer, 30', single pole, 2-wheel dolly, 25' bar w/ext. #2 (2) air fans, 16"
#6 Poly tank, 1,450 gal.